A regional daily has declared victory in its bid to save maternity services on its patch from being axed. North Wales’s Betsi Cadwaladr health board had planned to remove doctor-led maternity care at one of the region’s major hospitals. 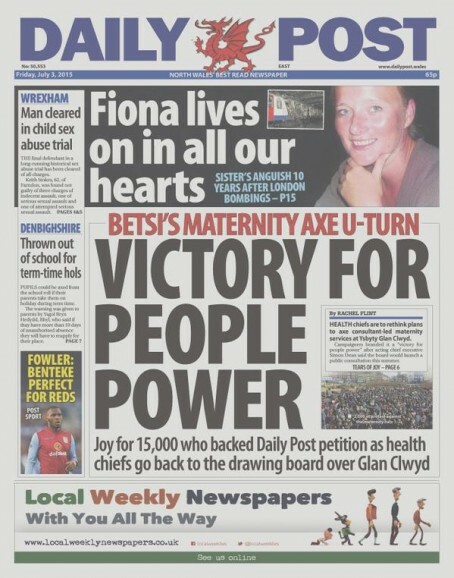 But the Daily Post pressured the Welsh government to intervene after launching a petition, which was signed by thousands of readers protesting against the plans. The proposals, exclusively revealed by the Post in February, would have seen doctor-led maternity care removed from Ysbyty Glan Clwyd (Glan Clwyd Hospital) for at least a year, and would have meant some pregnant mothers travelling to English hospitals for obstetrics care. The plans had been set for a judicial review, but the health board has now said it will not contest the legal battle and will instead launch a public consultation into the proposals. In a piece thanking readers for their role in the campaign, Post deputy editor Andrew Gilpin said it was “highly unlikely” the hospital would now be stripped of the service. Said Andrew: “You can take the credit for it. You always kept the pressure up. “Whether it be the thousands of you who turned up at a protest rally in Rhyl to show Betsi exactly what you thought of the decision or the mothers and campaigners who told their stories through our newspaper and website… you all never let it lie. Ah. Our old hack friend people power. No cliché there then?